TOKYO – Japan raised the crisis level at its crippled nuclear plant Tuesday to a severity on par with the 1986 Chernobyl disaster, citing high overall radiation leaks that have contaminated the air, tap water, vegetables and seawater. Japanese nuclear regulators said they raised the rating from 5 to 7 — the highest level on an international scale of nuclear accidents overseen by the International Atomic Energy Agency — after new assessments of radiation leaks from the Fukushima Dai-ichi plant since it was disabled by the March 11 tsunami. Continued aftershocks following the 9.0-magnitude megaquake on March 11 are impeding work on stabilizing the Fukushima plant — the latest a 6.3-magnitude one Tuesday that prompted plant operator Tokyo Electric Power Co., or TEPCO, to temporarily pull back workers. The government says the Chernobyl incident released 5.2 million terabecquerels into the air — about 10 times that of the Fukushima plant. In 2005, the Chernobyl Forum — a group comprising the International Atomic Energy Agency and several other U.N. groups — said fewer than 50 deaths could be confirmed as being connected to Chernobyl. It also said the number of radiation-related deaths among the 600,000 people who helped deal with the aftermath of the accident would ultimately be around 4,000. Associated Press writers Shino Yuasa and Noriko Kitano in Tokyo and Eric Talmadge in Soma contributed to this report. 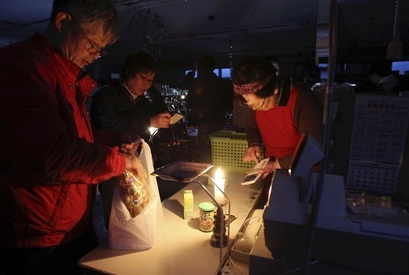 SENDAI, Japan – Nearly a half-million homes suffered blackouts in Japan’s northeast Friday after a new earthquake killed three people and piled more misery on a region buried under the rubble of last month’s devastating tsunami. The northeastern coast was still reeling from the destruction wrought by a jumbo 9.0-magnitude earthquake on March 11, with tens of thousands of households without power or water. The 7.1-magnitude aftershock Thursday threw even more areas into disarray and sent communities that had made some gains back to square one. Gasoline was scarce again, and long lines formed at stations. Stores that had only recently restocked their shelves sold out of basics Friday and were forced to ration purchases again. Still, the latest quake did far less damage, generated no tsunami and largely spared the region’s nuclear plants. Some slightly radioactive water spilled at one plant, but the tsunami-crippled Fukushima Dai-ichi complex reported no new problems. 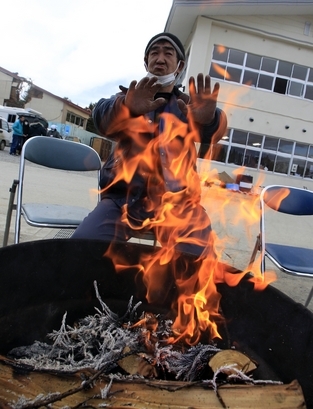 Matsuko Ito, who has been living in a shelter in the small northeastern city of Natori since the tsunami, said there’s no getting used to the terror of being awoken by shaking. She said she started screaming when the quake struck around 11:30 p.m. The latest tremor — the strongest since the day of the tsunami — cut power to more homes, though it was quickly restored to many. More than 450,000 households were still without electricity Friday evening, said Souta Nozu, a spokesman for Tohoku Electric Power Co., which serves northern Japan. That includes homes in prefectures in Japan’s northwest that had been spared in the first quake. Six conventional plants in the area were knocked out, though three have since come back online and the others should be up again within hours, Nozu said. But with power lines throughout the area damaged, it was not clear whether normal operations would be restored, he said. In Ichinoseki, lines formed outside a supermarket when it opened Friday morning. An employee with a flashlight escorted each customer around the store and jotted the price of each selected item in a pad. Most businesses were closed in the city, 240 miles (390 kilometers) northeast of Tokyo. One restaurant owner, Suzuki Koya, bought a small gas stove and made free meals in big boiling pot. Several nuclear power plants briefly switched to diesel generators but were reconnected to the grid by Friday afternoon. One plant north of Sendai briefly lost the ability to cool its spent fuel pools, but quickly got it back. At a plant in Onagawa, some radioactive water splashed out of the pools but did not leave a containment building, Tohoku Electric said. Such splash-out is “not unusual, although it is preferable that it doesn’t happen,” according to Japanese nuclear safety agency official Tomoho Yamada. “Closer inspection could find more problems,” said agency spokesman Hidehiko Nishiyama, but no radiation was released into the environment at Onagawa. The plant began leaking oil into the ocean in the first earthquake, and the flow escaped a containment boom in Thursday’s tremor but was contained again by Friday, coast guard spokesman Hideaki Takase said. Thursday’s quake prompted a tsunami warning of its own, but it was later canceled. Three people were killed. A 79-year-old man died of shock and a woman in her 60s was killed when power was cut to her oxygen tank, national fire and disaster agency spokesman Junichi Sawada reported Friday. 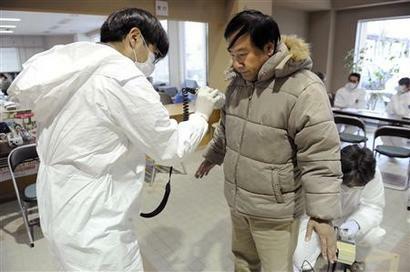 The third death was an 85-year-old man, according to a doctor at the Ishinomaki Red Cross Hospital. He declined to give his name because he was not authorized to speak to the media. That pales in comparison to the original quake and tsunami, in which more than 25,000 people are believed to have died. Many of those bodies have still not been found: A significant portion were likely washed out to sea and never will be, but some are buried in areas that have been largely off-limits to search teams. As radiation spilling from the troubled Fukushima Dai-ichi plant has fallen in recent days, however, police have fanned out inside a no-go zone near the complex to dig for the dead. On Friday, hundreds of police, many mobilized from Tokyo, used their hands or small shovels, pulling four bodies in an hour from one small area in the city of Minami Soma. The had found only five bodies the previous day. The searchers, wearing white radiation gear and blue gloves, struggled to bring the remains across the rubble to vans and minibuses that would take them to the nearest morgue. Each body was carefully hosed off to rid it of radiation before being placed in the vehicles. “The area is literally a mountain of debris. It is an extremely difficult task,” said an official with police in Fukushima prefecture who declined to be named because he was not authorized to talk to the media. The epicenter of Thursday’s temblor was in about the same location as the original 9.0-magnitude tremor, off the eastern coast and about 40 miles (65 kilometers) from Sendai, an industrial city on the eastern coast, according to the U.S. Geological Survey. 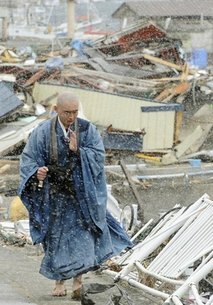 It was strong enough to shake buildings for about a minute as far away as Tokyo, about 200 miles (330 kilometers) away. At a Toyota dealership in Sendai, most of a two-story show window was shattered, and thick shards of glass were heaped in front of the building. Police directed cars through intersections throughout the city on Friday because traffic lights were out. Small electrical fires were reported. At the Fukushima Dai-ichi plant, where nuclear workers have been toiling to plug radiation leaks and restore cooling systems ruined in the March 11 quake and tsunami, workers briefly retreated to a shelter and suffered no injuries. The plant operator said the tremor caused no new problems there. Despite the new aftershock, automakers announced Friday that they were beginning to bounce back from the March monster. Toyota will resume car production at all its plants in Japan at half capacity from April 18 to 27. The world’s No. 1 automaker said it remained unclear when it would return to full production in Japan. Nissan also said it would start up domestic production at half capacity from April 11. Operations had been halted at both companies because of part shortages. Associated Press writers Shino Yuasa, Malcolm Foster, Ryan Nakashima, Mari Yamaguchi and Cara Rubinsky in Tokyo, Eric Talmadge in Minami Soma, and Colleen Slevin in Denver contributed to this report. 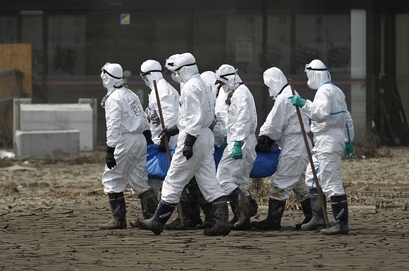 MINAMI SOMA, Japan – Japanese police raced Thursday to find thousands of missing bodies before they completely decompose along a stretch of tsunami-pummeled coast that has been largely off-limits because of a radiation-leaking nuclear plant. Nearly a month after a 9.0-magnitude earthquake generated the tsunami along Japan’s northeastern coast, more than 15,000 people are still missing. Many of those may have been washed out to sea and will never be found. In the days just after the March 11 disaster, searchers gingerly picked through mountains of tangled debris, hoping to find survivors. 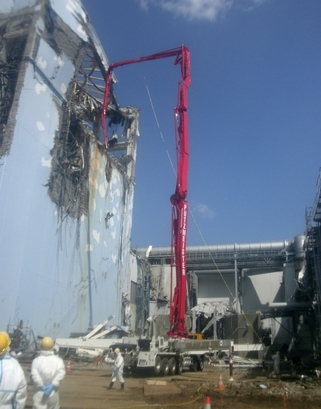 Heavier machinery has since been called in, but unpredictable tides of radiation from the Fukushima Dai-ichi nuclear complex have slowed progress and often forced authorities to abandon the search, especially within a 12-mile (20-kilometer) evacuation zone around the plant. Officials now say there’s not much time left to find and identify the dead, and are ramping up those efforts. More than 25,000 people are believed to have been killed, and 12,600 are confirmed dead. There is expected to be some overlap in the dead and missing tolls because not all the bodies have been identified. Recent progress at the plant — which the tsunami flooded — appears to have slowed the release of radiation into the ocean. Early Wednesday, technicians there plugged a crack that had been gushing contaminated water into the Pacific. Radiation levels in waters off the coast have fallen dramatically since then, though contaminated water continues to pool throughout the complex, often thwarting work there. A floating island storage facility — which officials hope will hold the radioactive water — arrived at the port near Tokyo on Thursday and will soon head to Fukushima. After notching a rare victory, technicians began pumping nitrogen into the chamber of reactor Thursday to reduce the risk of a hydrogen explosion. Three hydrogen blasts rocked the complex in the days immediately following the tsunami, which knocked out vital cooling systems. An internal report from March 26 by the U.S. Nuclear Regulatory Commission warned such explosions could occur again and recommended adding nitrogen. The gas will be injected into all three of the troubled reactors over the next six days. Plant operator Tokyo Electric Power Co. has been under intense pressure to get the crisis under control, and the company’s president was hospitalized last week amid reports he’d had a breakdown. Masataka Shimizu spent eight days in the hospital with dizziness and high blood pressure, but was back at work Thursday, according to spokesman Takashi Kurita. Radiation in the air, soil and water in Fukushima prefecture has also been declining since Saturday, and Tsunoda said a small team resumed the search there a day later. But the operation dramatically increased on Thursday, when 330 police and 650 soldiers fanned out, wearing white protective gear from head to toe. They are concentrating on areas between six and 12 miles (10 and 20 kilometers) from the plant — all of which are within the zone evacuated because of radiation fears. Chief Cabinet Secretary Yukio Edano said the government is studying ways to allow residents in the evacuation zones to return briefly to check on their homes and retrieve any possession that may be left, but they would have to be escorted and wear protective gear. The government has said it may expand the evacuation zone due to concerns about longer-term radiation exposure as the crisis wears on. Iitate village, about 25 miles (40 kilometers) from Fukushima Dai-ichi, said Thursday it is advising pregnant women and children under 3 to go to hotels farther from the plant. The International Atomic Energy Agency last month reported high levels of contamination in Iitate’s soil. Village officials did not say why they are just now telling some people to leave. On the fringes of Minami Soma, a city that straddles the no-go zone and was flattened in the crush of water, teams patrolled deserted streets Thursday. Packs of dogs caked with mud and the searchers were the only beings roaming the emptied streets. One area inside the evacuation area seemed frozen in time: Doors swung open, bicycles lined the streets, a lone taxi sat outside the local train station. One body was pulled out of the rubble Thursday morning. “We just got started here this morning, so we expect there will be many more,” said one officer, who requested anonymity because he was not authorized to speak to the media. More than 1,000 people are missing in the city alone. Last weekend, U.S. and Japanese troops conducted a massive, all-out search of coastal waters, finding about 70 bodies over three days. While such operations haven’t stopped completely, they’ll be severely limited going forward. The death toll for the 2004 Asian tsunami includes tens of thousands of bodies that were never found, likely sucked out to sea. Meanwhile, the U.S. State Department confirmed the death of Montgomery Dickson — the second American confirmed killed in the disaster. It gave no other details. While some progress has been made at the nuclear complex in recent days, radiation spewed over the past few weeks continues to travel — in trace amounts — farther afield. On Thursday, one South Korean province allowed schools to cancel classes after rain containing small amounts of radiation fell in the area. The contamination posed no health threat, according to the prime minister’s office. Yuasa reported from Tokyo. Associated Press writer Mari Yamaguchi in Tokyo and Matthew Daly in Washington also contributed. TOKYO – Workers used a milky bathwater dye Monday as they frantically tried to trace the path of radioactive water seeping into the ocean from Japan’s tsunami-damaged nuclear plant. The crack in a maintenance pit discovered over the weekend was the latest confirmation that radioactivity continues to spill into the environment. The leak is a symptom of the primary difficulty at the Fukushima Dai-ichi complex: Radioactive water is pooling around the plant and preventing workers from powering up cooling systems needed to stabilize dangerously vulnerable fuel rods. The plant operators also deliberately dumped 10,000 tons of tainted water — measuring about 500 times above the legal limit for radiactivity — into the ocean Monday to make space at a storage site for water that is even more highly radiactive. Engineers have turned to a host of improvised and sometimes bizarre methods to tame the nuclear plant after it was crippled in Japan’s magnitude 9.0 quake and tsunami on March 11. Efforts over the weekend to clog the leak with a special polymer, sawdust and even shredded newspapers failed to halt the flow at a cracked concrete maintenance pit near the shoreline. The water in that leak contains radioactive iodine at rates 10,000 times the legal limit. Suspecting they might be targeting the wrong channel to the pit, workers tried to confirm the leak’s pathway by dumping several pounds (kilograms) of salts used to give bathwater a milky hue into the system, plant operator Tokyo Electric Power Co. said Monday. “There could be other possible passages that the water may be traveling. We must watch carefully and contain it as quickly as possible,” said Hidehiko Nishiyama, a spokesman for the Nuclear Safety and Industrial Agency. Radioactive water has pooled throughout the plant because the operator has been forced to rely on makeshift ways of pumping water into the reactors — and allowing it to gush out wherever it can — to bring down temperatures and pressure in the cores. Government officials conceded Sunday that it will likely be several months before the cooling systems are completely restored. And even after that happens, there will be years of work ahead to clean up the area around the complex and figure out what to do with it. The makeshift system makes it difficult to contain the radiation leaks, but it is aimed a preventing fuel rods from going into a full meltdown that would release even more radiactivity into the environment. To that end, the plant’s operator, Tokyo Electric Power Co., said it jettisoned the 10,000 tons of water Monday, clearing space in a waste-storage facility. The government decided to allow the step as “an unavoidable emergency measure,” Chief Cabinet Secretary Yukio Edano said. An additional 1,500 tons will be dumped from a trench under the plant’s units 5 and 6. That water is threatening to interfere with the workings at those units, whose reactors are under control. Radioactivity is quickly diluted in the ocean, and Edano said the dump should not affect the safety of seafood in the area. The crisis has unfolded as Japan deals with the aftermath of twin natural disasters that decimated large swaths of its northeastern coast. Up to 25,000 people are believed to have died in the disaster, and tens of thousands lost their homes. Thousands more were forced to flee a 12-mile (20-kilometer) radius around the plant because of the radiation. The 8-inch-long (20-centimeter-long) crack was discovered in the maintenance pit over the weekend. It is sending radioactive water into area that is normally blocked off by a seawall, but a crack was also discovered in that outer barrier Monday. Though it later authorized the dumping of slightly radioactive water, the government said Monday it was growing concerned about the sheer volume of contaminated materials spilling into the Pacific. It is not clear how much water has leaked from the pit so far. The crisis has sparked protests in Japan and raised questions around the world about the safety of nuclear power. The head of the International Atomic Energy Agency told delegates at a nuclear safety conference Monday that the industry cannot afford to ignore these concerns. “We cannot take a ‘business as usual’ approach,” Yukiya Amano said. The operator said Monday it is ordering fencing that is typically used to contain oil spills. The screens are not designed to trap radioactivity but might curtail the flow of water and thus reduce the spread of contamination, said TEPCO manager Teruaki Kobayashi. It was not clear when they would arrive. All of the plant’s reactors were designed by General Electric, and the company’s CEO met Sunday with TEPCO’s chairman. Jeffrey Immelt told reporters Monday that more than 1,000 engineers from GE and its partner Hitachi are helping to analyze the problems at the plant. Immelt also offered assistance in dealing with the electricity shortage brought on by damage to Dai-ichi and other power plants. Japan is expecting a shortfall of at least 10 million kilowatts come summer. Gas turbines are on their way from the U.S. with both long- and short-term capabilities, Immelt said. Associated Press writer Ryan Nakashima in Tokyo contributed to this report. GREENBRIER, Ark. – The central Arkansas town of Greenbrier has been plagued for months by hundreds of small earthquakes, and after being woken up by the largest quake to hit the state in 35 years, residents said Monday they’re unsettled by the increasing severity and lack of warning. The U.S. Geological Survey recorded the quake at 11 p.m. Sunday, centered just northeast of Greenbrier, about 40 miles north of Little Rock. It was the largest of more than 800 quakes to strike the area since September in what is now being called the Guy-Greenbrier earthquake swarm. The activity has garnered national attention and researchers are studying whether there’s a possible connection to the region’s natural gas drilling industry. The earthquake activity varies each week, though as many as nearly two dozen small quakes have occurred in a day. What woke Tarkington was a magnitude 4.7 earthquake that was also felt in Oklahoma, Missouri, Tennessee and Mississippi. No injuries or major damage have been reported, but the escalation in the severity of quakes in and around the small north-central Arkansas town has many residents on edge. Some said they’re seeing gradual damage to their homes, such as cracks in walls and driveways. “We probably had 40 to 50 calls last night,” Greenbrier police Sgt. Rick Woody said, noting that the tone of the calls had changed. After pervious quakes, most callers simply wanted to find out if a loud noise they’d heard was an earthquake, he said. Scott Ausbrooks, seismologist for the Arkansas Geological Survey, said Sunday’s record quake was at the “max end” of what scientists expect to happen, basing that judgment on this swarm and others in the past. It’s possible that a quake ranging from magnitude 5.0 to 5.5 could occur, but anything greater than that is highly unlikely, he said. Ausbrooks said he plans to hold a town hall meeting in Greenbrier next month to address people’s concerns. Ausbrooks said scientists continue to study whether there may be a connection between the earthquakes and local injection wells, where the natural gas industry pumps waste water that can no longer be used by drillers for hydraulic fracturing. Fracturing, or “fracking,” involves injecting pressurized water to create fractures deep in the ground to help free the gas. Geologists don’t believe the fracturing is the problem, but possibly the injection wells. A major source of the state’s natural gas is the Fayetteville Shale, an organically-rich rock formation in north-central Arkansas. A six-month moratorium was established in January on new injection wells in the area to allow time to study the relationship — if any — between the wells and the earthquakes. In Greenbrier, many residents are starting to notice gradual damage. Tarkington said her house has started to show cracks in ceilings and walls. Taylor Farrell, 29, a Greenbrier resident and employee at a local flea market, said a large crack formed in her driveway several months ago, and as the earthquakes continue, the crack has spread into her garage. She said she and her husband had removed everything from the walls of their house, including family photos and television sets, because many photos had fallen in recent quakes.